St.Francis College for Women, Hyderabad has advertised in the DECCAN CHRONICLE newspaper for recruitment of Lecturers Plus Non-Faculty jobs vacancies. Interested and eligible job aspirants are requested to apply on or before 29th March 2018. Check out further more details below. About College: St. Francis College For Women, started in 1959, is a Catholic minority institution founded by the Sisters Of Charity, for the holistic education and empowerment of women. The college is housed in an impressive campus spread over eight acres in the heart of the twin cities of Hyderabad and Secunderabad. From a modest student strength of 15 in 1959, the college has grown into a prestigious institution offering undergraduate and postgraduate courses, with a student force of 3200. In addition, it has a staff strength of 160 teaching members and 110 non-teaching members. How to Apply: Interested candidates are requested to register their application in the college office in person from 20th to 29th March 2019. The college address has been provided below. Note that application sent through postal is NOT accepted. Only apply in person. 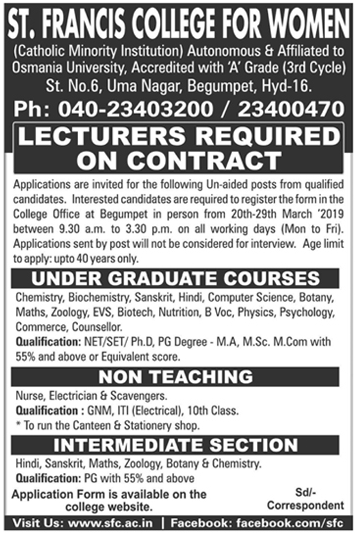 Reference: Advertisement on DECCAN CHRONICLE newspaper Dated 21st March 2019.